We spotted this very cool promotional product while at Trust-Mart in Guangzhou, China. Darlie, a renowned toothpaste company, recently had this on-pack promotion! Every purchase of a 2-pack Darlie toothpaste entitles you to this ceramic cup. USEFUL – A multipurpose item, it can be used as a cup or a toothbrush holder; Both would definitely be great additions to the household. ATTRACTIVE – Freebie and Darlie lovers would flock to buy this on pack promotion because this incentive gift has a classic and simple design. However, this promotional item can be improved by Branding. 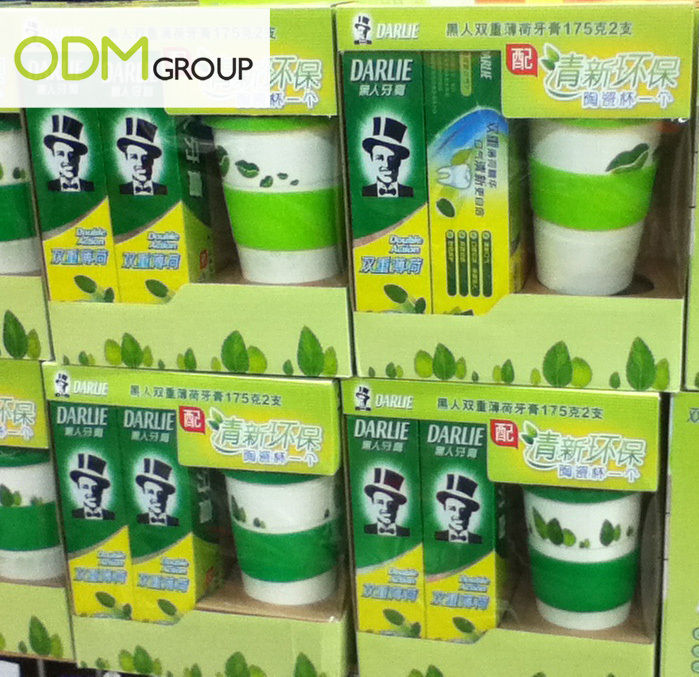 The Darlie trademark is not visible on the cup, so even if the cup is seen twice a day, people will not be reminded of the brand. Some methods of branding that could be done would be acid etching and laser engraving. We think that Darlie could have made the cup into a better marketing tool but if you think that it could be a good promotional item, do not hesitate in contact us to get more information.